Product categories of OEM Laser Module, we are specialized manufacturers from China, OEM Laser Module, Laser Module for Easy Integration suppliers/factory, wholesale high-quality products of Line Laser Module R & D and manufacturing, we have the perfect after-sales service and technical support. Look forward to your cooperation! 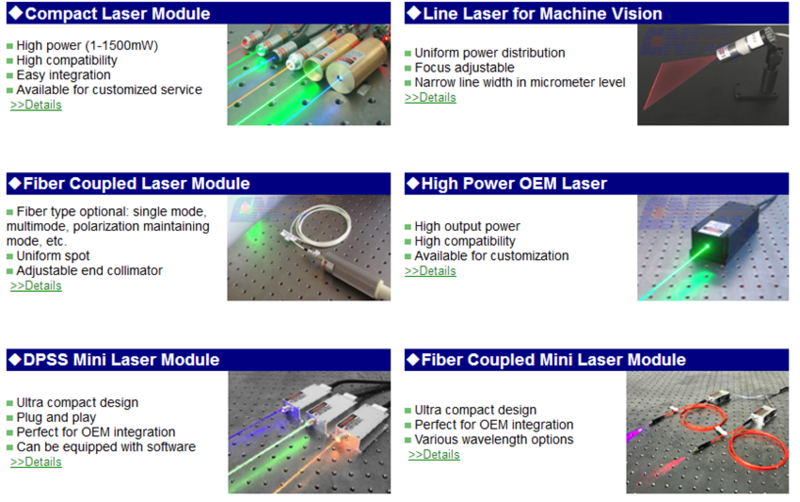 CNI developed compact Laser modules with spot, line, cross and fiber coupled beam. Features of small size, high compatibility, cost-effectiveness and easy integration. They are suitable to be integrated into instruments and OEM equipments, also a reasonable solution for other applications. The Laser Diode, cavity and optical and electronic devices can be sealed in one housing, which helps customers easily install to their own equipments. CNI always welcome customized requirements, an external heat sink, PC board can be provided on request.